Based on 17th century German Schrank found in Illustrated Cabinet Making. (Hylton 324-327) It measures 77×48 x 27, is made of Idaho White Fir 2×6, S4S 1×6 pine, ¼ Luan underlayment and ¾ pine plywood. It is sealed with Amber Shellac. Finished with water based poly and wax. All materials and hardware from the big box, I did try to do business with local sawyers and retailers, all to no avail and a waste of time and expense. Most of the 2×6 are ripped and glued up on the quarter. IT WOULD BE WAY COOL IF YOU COULD POST A COUPLE OF PHOTOS WITH THE KNOCKDOWN CAPABILITY SHOWN. ANYWAY, I LIKE YOUR PROJECT AND APPEARS THAT A LOT OF TIME, EFFORT AND INGINUITY HAS GONE INTO IT. GOOD JOB!! Making it out of fir was a challenge. Soft and furry. Splinters galore. 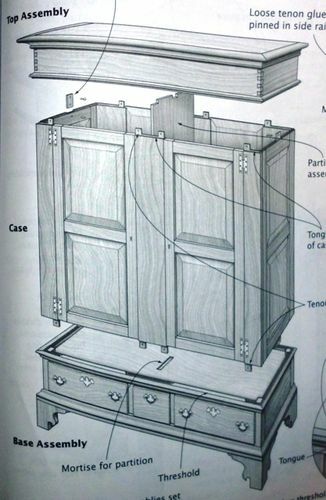 Sorry no pictures of it broke down, but here are a couple from Cabinet making illustrated. look out for a review of it. Make a cabinet and it will be filled. 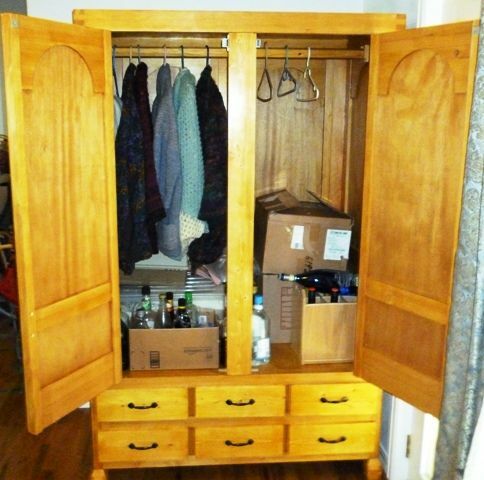 Contrary to particle board furniture, it can withstand numerous moves (and it is much lighter). Is it kept together only by the mass of the top? Is it safe to push it without such a link? 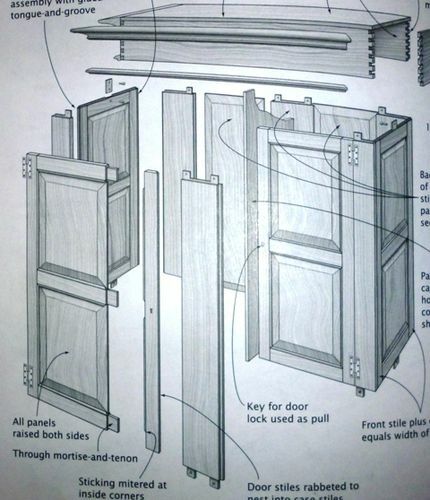 The only hardware is what you see, the hinges, door handles, magnetic catches and drawer pulls. It is far lighter than the particle board coat closet it replaced, which was destroyed by water when the laundry machine broke. 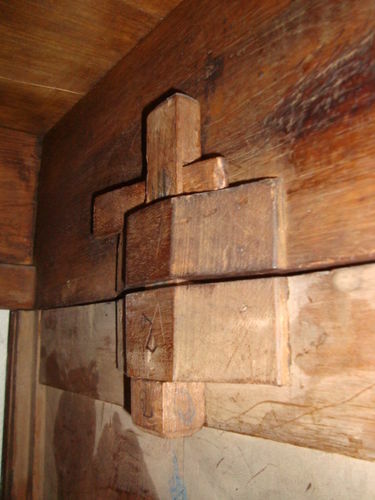 It is held together by 6 tenons top and bottom (twelve total, no glue) and 4 vertical splines (not glued) across the back. Once it is completely assembled it is very ridged/sturdy. I assembled it in the middle of the room and pushed it into place. Real wood might suffer from humidity but particle board will inevitably be totally ruined. Great looking piece of furniture, great design and very well executed. Beautiful wood and finish. Great job! Great Job! It’s beautiful. Love the finish. See you made some changes from the plan. I like your feet better, too. The arches were cut on the band saw from the glued up board. The shoulders were cut in the arches with a carbide wheel in a high speed rotary tool with router attachment and the waste removed with a 1/4 in chisel. Thanks for the interest Gene, and I have an appreciation for your signature line. Love, like victory, belongs to God.